La Fête du Citron (the Lemon Festival of Menton), a unique event on the Cote d'Azur, with a fortnight of fun around the theme Fantastics Worlds. Stilt walkers, musicians, actors and acrobats provide both daytime and evening entertainment during the float processions. Narwhals, whales, giant squid and other creatures take over the Biovès Gardens and reveal all their secrets in the spotlights of the Gardens of Light. 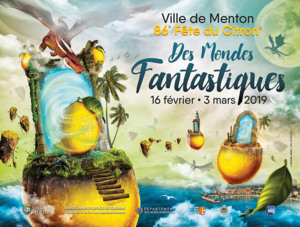 La Fête du Citron® (Lemon Festival), an unique event in the world, attracts 240,000 visitors every year – a number which is constantly rising. With processions of floats, gardens of lights and the exhibition of giant designs, come and discover this fantasy world, and move to the rhythm of a simply unforgettable event. More than 300 professionals work on the project and 145 tons of citrus fruits are used. 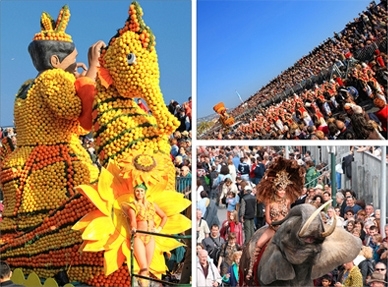 Parades of gol4en fruit along Promenade du Soleil, with splendid floats decorated with citrus fruit and moving figures. Between each float, musical bands of all kinds, folk groups and majorettes to set the atmosphere. Time to party! Brass bands, orchestras, folk groups, dancers and the plain mischievous add a spark of splendour to the parade worthy of the most ambitious street festivals! On saturday 16 february 2019 opening hour à 2 pm. In the Biovès Garden, travel round the world with citrus fruit, visiting the entire planet thanks to splendid compositions made with lemons and oranges. 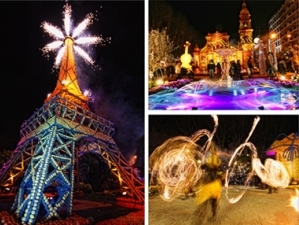 The Garden of Light opens a world with a magical play of sound and light. Exhibition of the finest orchid specimens in an exotic setting of plants and water. 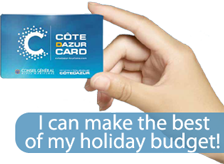 Taste the citrus flavours and local foods that make up the Menton’s gourmet smorgasbord of delights.